In this fitness-focused episode, my friend Bernie (former Biggest Loser “winner” and chronic dieter) and I get into a heated argument about his former trainer Bob Harper’s recent appearance on Megyn Kelly TODAY about weight shame. I think it’s ridiculous that Bob somehow thinks applying “firm kindness” to higher weight people is actually helpful caregiving. I’m mostly irritated with the segment because it would have been a wonderful opportunity for a Health at Every Size advocate to discuss the value of weight inclusivity and the harms of dieting in weight cycling and raising BMI. Watch the clip here and decide for yourself. 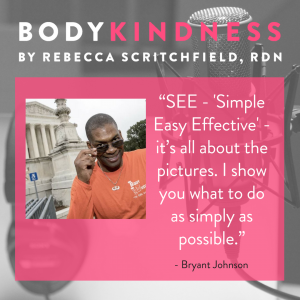 Don’t miss our fun interview with Bryant Johnson, a trainer I wholeheartedly recommend because he works with the Justice of my dreams, Ruth Bader Ginsburg. 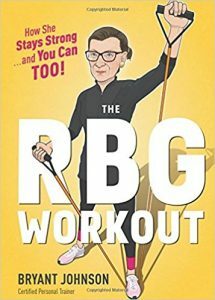 Bryant’s new book RBG Workout is a handy tool for people who want practical, easy-to-follow movements and no-nonsense advice for strength, flexibility, and mindset for consistent movement. Bryant Johnson spent over 30 years in the United States Army with 12 of those years as a member of a Special Forces Airborne Unit. For over 19 years he has been a personal trainer to various military and civilian personnel, including high level Federal Court officials; Justices, Judges, Attorneys, and Clerks. His new book The RGB Workout is out now.